It never fails, after we’ve had a lovely family dinner together and we’ve cleaned up all the dishes, suddenly the kids disperse like a bunch of ants at a picnic, only much louder…much, much louder. Those few hours between dinner and bedtime always seem to be the most chaotic and loudest times in our house. It’s like the kids didn’t get the memo that these few hours should be peaceful and relaxing, not chaotic and out of control. Lucky for us, there are a few tricks we can arm ourselves with to have a smooth and less chaotic bedtime. I used to think that bedtimes had to be filled with meltdowns, arguments over toothbrushes and lots and lots of jumping on the bed. I’ve also seen my fair share of naked heinies running through the house right before bedtime and when I do finally get everyone settled into their own bed, lights out, house quiet, I plop down on the couch and remember, I’ve got to do it all over again the next day. At least I used to be like that… until I found these super simple bedtime routines that actually calmed kids down. Today I can’t wait to share those with you. Just for a moment, I want you to place yourself in your kid’s shoes. From the moment they wake up until the moment that they go to bed, they are pulled in directions. We are constantly putting demands on children, giving them things to do and places to go, not to mention all the interactions they have in a single day. Think about how many different personalities they run into from the time they wake up until the time they get ready for bed. The 30 kids in their classroom, their mom, their dad, their aunts, their uncles, their grandparents, their teachers, the principal, the cafeteria lady, the person at the grocery store that wanted to randomly talk to them. They are constantly being bombarded with people and things and thoughts and ideas and unfortunately, they don’t come with this magic switch that allows them to just magically turn off their brain at the end of the night and transition into a calm routine. That’s where we come in. It is our job to help our children transition from the busy, chaotic day that they’ve just had into a smooth and calming bedtime routine, so that they can relax their mind and body and get prepared for the next day. Here are five tips for setting up a rockstar bedtime routine that every kid will love. Setting up a successful bedtime routine actually starts a lot earlier then you might think. It doesn’t start at six o’clock or seven o’clock, it doesn’t at bath time, no instead it starts from the moment that your child comes home from school or wherever they’ve been for the day and once you get really good at it, it actually starts the night before. When children know what is expected of them and it’s consistently there for them to count on, then they are able to respond by following the steps easier and transitioning into a smoother, relaxed routine. Step two, talk about their day. It’s so easy as adults to get in the habit of saying, “How was your day?” and our children responding with, “Fine,” or “What did you do today?” “Nothing,” and then that’s usually the end of the conversation, but I want to challenge you to push your children to have a deeper, more connected conversation after school each day. What was your favorite class today? What was the hardest thing you did today? What was the easiest thing you did today? What was something funny that happened to you today? 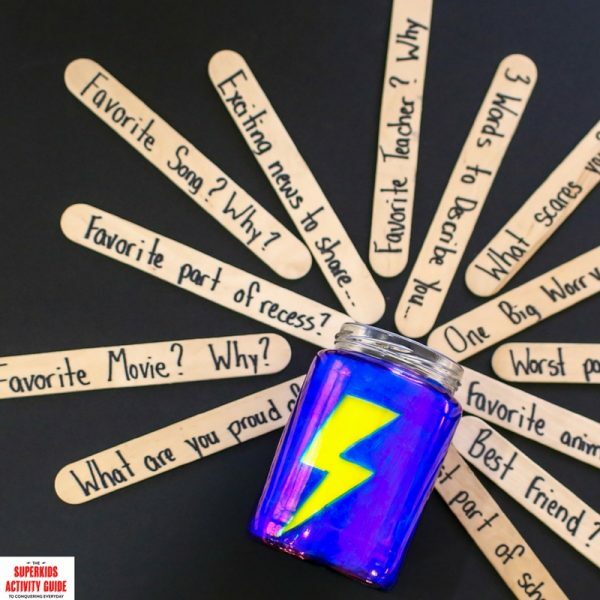 Asking questions like this will not only build the connection that you have with your child, but also will allow them to decompress and go ahead and get all those thoughts from the day out of their brain so that they can open up for a calmer evening. 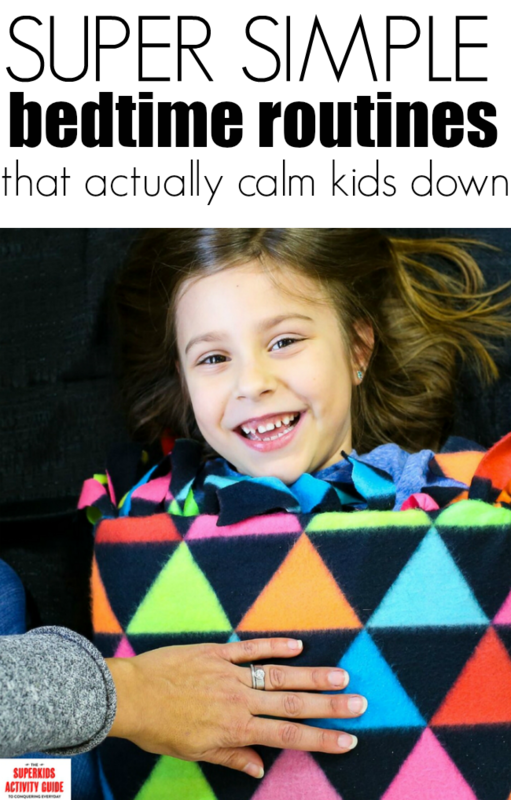 I know I just said that we’re working towards a calmer evening and moving doesn’t sound very calm, in fact, you’re probably envisioning your child jumping on the couch or running around the house refusing to put on their pajamas, however they’re doing that because they need movement. They need that sensory input before they have to lay their head on their pillow and rest for 8 to 12 hours. Instead of waiting right until before they go to bed and them starting to rile up and get all excited, go ahead and put that movement into their afternoon from the moment they get home until the time that it’s time to go to sleep. You can do this through simple animal walks, exercises, or even chair exercises while you’re sitting at the dinner table. The key is to be proactive. Give your kids the movement and input that they need before it becomes a problem and they are so hyper that they can’t regulate that excitement. Step four, make it visual. This is one of my favorite tips in making any routine successful, but even I forget to do this. When my house starts to get crazy, it’s the first thing I go to, to adding back into our routine. Making your routine visual is easy as drawing little stick figures or making a to-do-list. In my new book, The Superkids Activity Guide to Conquering Every Day, I have several visuals that will help you establish a routine with your children. The What’s Next Chart is perfect for helping kids see what is coming next and what is to be expected of them. Step five, give them a squeeze. I’m not just talking about giving your kids hugs and love and attention, although, those are a great addition to any bedtime routine if you ask me. What I’m talking about here is actually giving your kids some squeezes, gently. Putting pressure on your joints and muscles gives your body proprioceptive input, which is grounding and calming, which is perfect right before bedtime. A night time bath with calming bath bombs gives your child a whole body squeeze from the water. A simple game of hot dog with a blanket wrapped around your child is a super fun way to give gentle squeezes to their arms, legs, and belly. 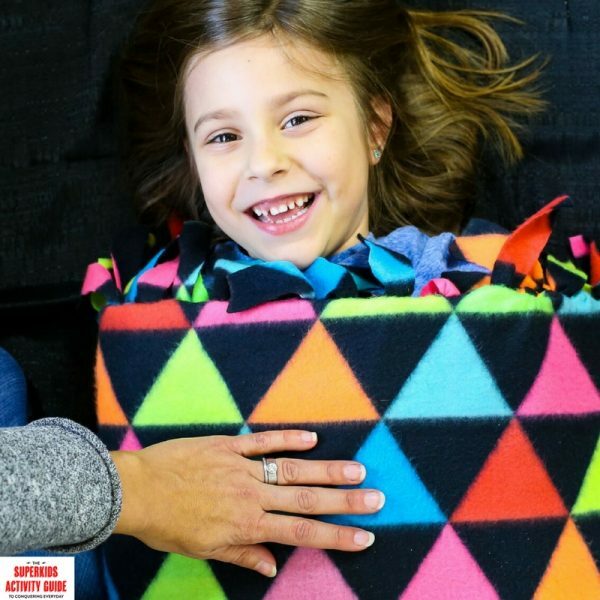 Finally, adding a weighted blanket to the top of their bed can give your child the pressure they need to feel grounded, secure and calm for a good night’s rest. After implementing these five simple steps for a rockstar night time routine, you can put your kids to bed with ease and actually sit down, take a deep breath and enjoy the silence after they go to bed. I’m not promising you perfection on the first run, but if you stick with it and you trust me, these strategies can help you and your children feel more successful before bedtime. 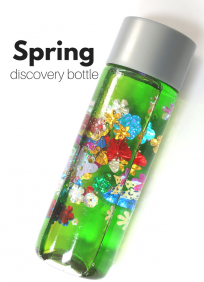 A NOTE FROM ALLISON: I can”™t recommend Dayna Abraham”™s new book highly enough! 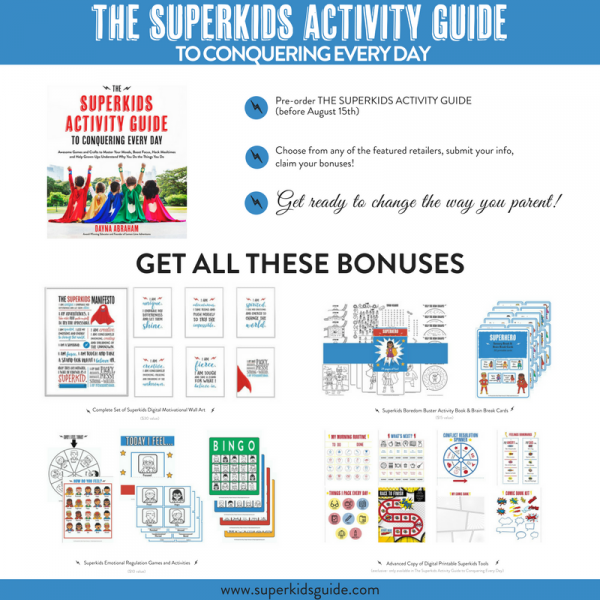 The Superkids Activity Guide to Conquering Every Day is packed with real ways to turn struggles into strengths! 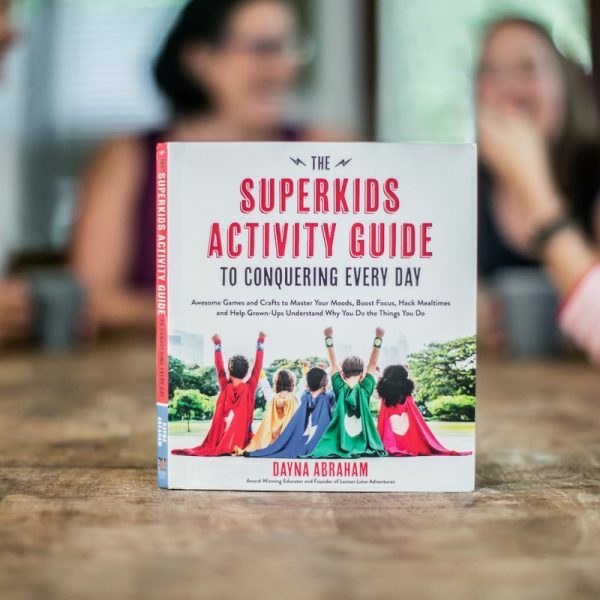 What began as a simple book with 75 simple crafts, games and activities to help adults and kids manage the most difficult parts of the day (mornings, wait times, mealtime, playtime, learning, and nighttime), The Superkids Activity Guide, slowly became a movement. The Superkids Movement and Activity Guide is aimed to empower ALL kids to speak up, share their superpowers and learn why they do the things they do so they can advocate for themselves!! PRE-ORDER BONUS! I encourage you to order your copy of Dayna”™s new book. With any purchase before August 15, 2017, comes a collection of empowering, engaging and exciting tools and reminders to embrace and empower ALL Kids for their strengths and help them be the Superkid they already are! Just fill out this form here and email your receipt to preorder@superkidsguide.com. Dayna Abraham is the mother to three totally awesome superkids who inspire her every day to be the best grown-up sidekick they could ask for. 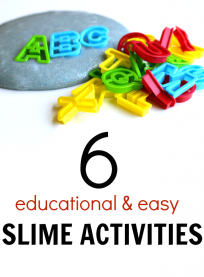 When she”™s not helping her kids conquer the world, she keeps busy by writing at lemonlimeadventures.com, writing books like Sensory Processing 101 ,STEAM Kids, and Learn and Play with LEGO®, and drinking lots of coffee. 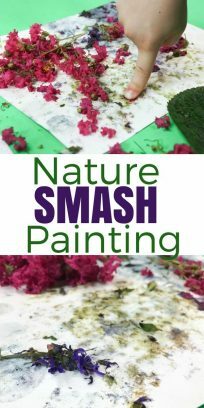 She loves getting her hands messy and creating crazy science projects and crafts to keep her super kids at home busy. Before she was a writer, she was a National Board Certified teacher, where she met some of the coolest superkids on earth. As a little girl, she wished grown-ups and other kids saw her as a superkid, so now she”™s made it her mission to inspire kids like you to love who they are and embrace their differences.